Visitors have accessed this post 35088 times. Even Numbers are any integer that can be divided exactly by 2. The last digit will be 0, 2, 4, 6 or 8. 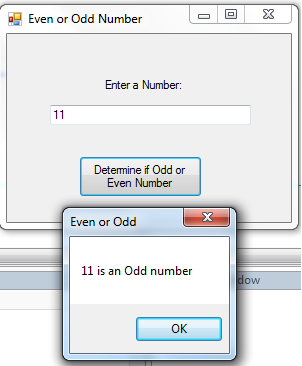 If it is not an even number, it is called an odd number. The last digit will be 1, 3, 5, 7 or 9. 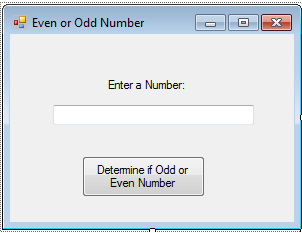 In this tutorial, we will create a program that can determine a number whether odd or even. Now, let's start this tutorial! 1. Let's start with creating a Windows Form Application for this tutorial by following the following steps in Microsoft Visual Studio: Go to File, click New Project, and choose Windows Application. We initialized variable Mynumber as Integer to hold the value inputted in textbox1. The main reason to get the even number is to get their value as divisible by 2 that is equal to zero. So that is why we used the Mod function. Mod Operator divides two numbers and returns only the remainder. 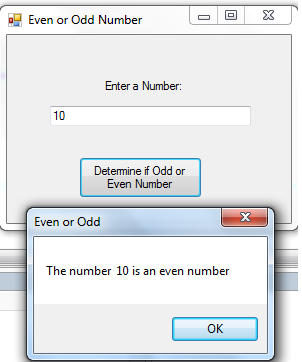 The number inputted in textbox1 was divided by 2 and if the remainder is zero then we considered it as an even number. Otherwise, it is an odd number in our If-Else statement.